Botox is approved to treat crow’s feet. The repetitive contraction of underlying facial muscles that happens every day may lead to crow’s feet, laugh lines, and frown lines as we age. Botox® Cosmetic injections provide a non-surgical way of reversing some of these visible signs of aging. Dynamic lines occur with every smile, laugh, or frown. These can lead to wrinkles that are present even when you are not expressing emotion. 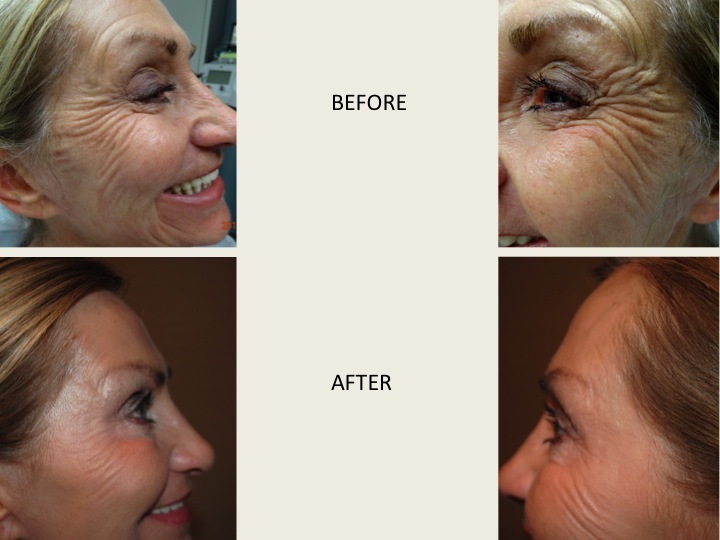 Botox® Cosmetic works by blocking the nerve impulses to the wrinkle producing muscles so they do not contract. As a result, the overlying skin will be smooth and unwrinkled. The untreated muscles will allow for normal facial expression to remain unaffected. The treatment is simple with minimal discomfort, requires only a few minutes, and you can immediately resume normal activity. Dr. Goldenberg will administer very precise injections into the areas selected for treatment. The results will be apparent in a few days with continued smoothing of the skin occurring for a few weeks after the first treatment. You will still be able to laugh, smile, or frown, but without the wrinkles. The duration of effect is between four and six months, and long-term maintenance of smooth skin can be achieved by repeated treatments.